The Doherty sisters from Ireland who were enjoying their first ski holiday at Cairngorm Mountain. Picture by Peter Jolly. It might be unseasonably mild out there – but that did not stop skiers making their way to the beleaguered CairnGorm Mountain resort at the weekend. 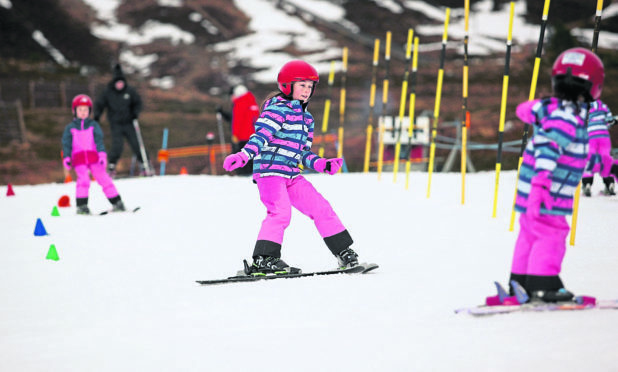 The resort is one of three in the country that is producing artificial snow this season, along with Lochaber’s Glencoe and the Lecht in the north east. Among those enjoying the conditions this weekend were Jane Dimelow, from Blackpool, who was having her first ski lessons. Mya Bill and her friend Sophie Etherington, both from Strathaven, were there with Mya’s parents – and were having great fun playing in the snow that was being made. There were dozens of people getting lessons including five sisters from Ireland who were having there first ski holiday. Snowmaking machines at crisis-hit CairnGorm Mountain have started up in a bid to boost the ski resort’s fortunes after the resort’s shock funicular railway closure. Engineers discovered worrying problems with the structures that support its tracks. No timescale has yet been given for its return to operation. Scottish Government funded development agency Highlands and Islands Enterprise, which owns the resort, recently set up a company to take over the operation of CairnGorm Mountain from administrators of the previous lessees. The other two Scottish resorts – Glenshee and Nevis Range – do not have enough real snow yet. Scottish snow sports boosted the economy by almost £31 million last season, according to latest estimates. But additional investment in Scotland’s five ski centres is considered a key factor in maintaining visitor numbers, says the research. The new estimates apply latest figures of ‘skier days’ for the 2017/18 season to existing methodology to give an economic benefit of £30,892,375 to Scotland’s rural economy. It is estimated that for every £1 spent on the Scottish slopes, a further £4 is spent in the surrounding area at Glenshee, Glencoe, Cairngorm, Nevis Range and the Lecht. There were over a quarter of a million skier days recorded in 2017/18. While this is less than the peak of 631,000 skier days recorded in 1991 it is markedly up on the ten-year average to 2010 – of less than 200,000 – which was seen as a likely future for Scottish snow sports. Had the number of skiers and boarders visiting Scotland’s slopes continued at under 200,000 each season it would have meant £6 million less to Scotland’s economy last year.